Good morning! This is Pamela on Mama Elephant's blog today and I have a super fun project to show you! I have been a little bit crazy about ramen these days and we've been cooking up a lot of them for dinner because they're so simple to prepare. With that, I would like to invite you all to a ramen dinner party at my place! But first, we need to give you the invitations to the ramen party. 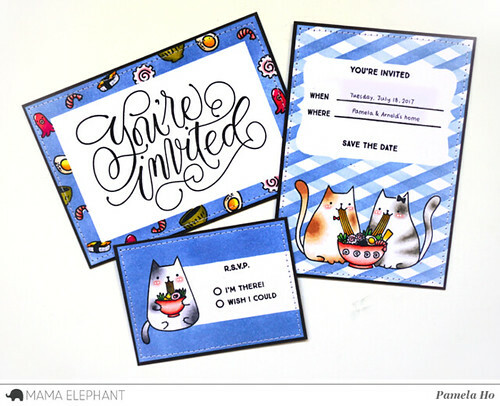 I combined DIY Invitation and Invitation Wishes together on my cards as well as Nom Nom Kitties for a one-of-a-kind invitation. 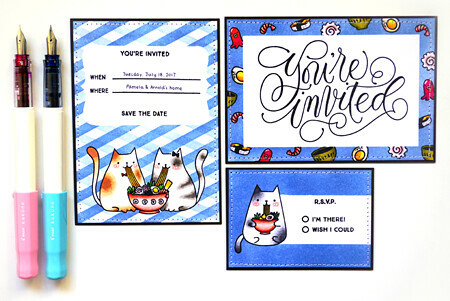 First, I stamped my kitties onto a card (3.5in x 5in). I coloured them with my copics and then I masked it off with some post-its. 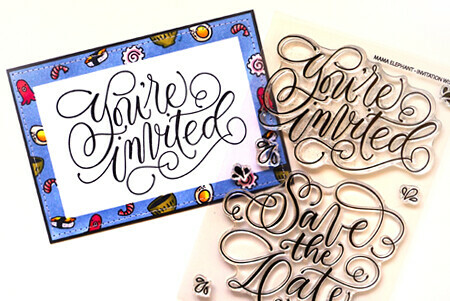 Next, I used the curly brackets from Index Card cc to mask off an area for me to stamp my invite information. Then I masked off my plaids and started blending! This entire card base is then stitched onto a piece of dark grey cardstock. Next, I need a bold greeting shouting You're Invited!. I stamped the large sentiment onto another piece of card (5in x 3.5in) and masked off the middle part, leaving a border. 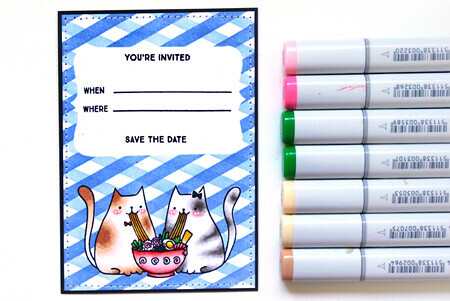 I stamped the little elements from Nom Nom Kitties and coloured them with my copics. I masked each element off with my post-its so I could blend in a nice shade of blue for the border. This card base is again stitched to a piece of dark grey cardstock. Then this set of invitation is simply wrapped up with a piece of vellum strip. I'm loving the bold sentiment and the bold colours! 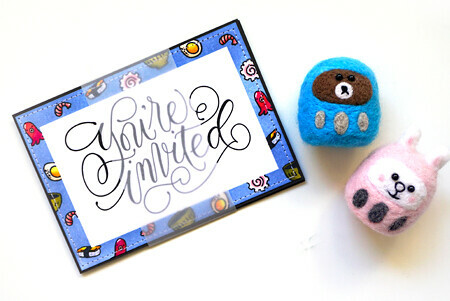 Oh and of course, I can't leave out a little RSVP card! I cut out a piece of cardstock (2.5in x 3.5in) and stamped one of the kitties on the left side. I masked off a strip of white so I could give the border a nice blended blue shade. And here you have it! My invitation to a ramen-party! Would you care to join us that night? Definitely would join, I love ramen. Haven't tried it making it at home though since the "top ramen" days. That is so cute! However, I hate ramen...lol. I would keep this invitation forever though!